One of the inevitable facts of life for pool owners is the presence of algae. There are many different types of swimming pool algae. Algae is a necessary part of the naturally occurring cycle of life. However algae produces unsightly discoloration and causes damage to swimming pools. The accumulation of algae in pool water can occur very rapidly and be difficult to remove. There is a wide variety of pool algae removal products available online or in local pool shops. Sometimes it takes a pool professional to fully address the problem of algae growth in a swimming pool. ProTouch Pool Services offers San Diego pool owners pool algae removal along with other pool restoration services. One of the first signs of algae growth is green or yellow discoloration on the walls and steps. Algae forms as yellow or mustard algae, brown algae, green algae and black algae. The most immediate and obvious effect of excessive algae growth is the temporary loss of use. Nobody wants to swim in a swimming pool or spa that looks unsightly. The excessive algae makes it simply too unappealing for family and friends to enjoy. Algae buildup has the potential to make a pool unusable for days or even weeks. This can be especially inconvenient during the height of summer. Algae build up may be caused by an imbalance of the swimming pool water such as high phosphate levels. Algae can be present despite the best efforts of the homeowner. It is important to realize that correcting an algae problem may take a combination of different approaches. Homeowners often try to curb algae growth by using various over the counter solutions. Often they find they have spent a lot of money and have not solved the algae problem. When their attempts at pool algae removal do not work, homeowners may need to seek the help of ProTouch Pool Services. 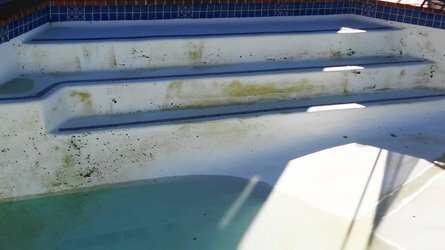 Algae cleanup and removal is a common request from San Diego swimming pool owners. Especially when they are not able to use and enjoy their investment due to an unattractive greenish pool color and unpleasant odor. Pool algae can begin in small patches that seem harmless. It can grow at a very rapid and aggressive rate making the pool unusable. Stubborn algae can require extensive and repeated treatments to fully remove. ProTouch Pool Services specializes in a number of different pool treatments for pool algae removal for San Diego County. Our professional pool algae treatments are more effective than the do-it-yourself attempts by homeowners. Our pool water chemistry knowledge is the difference. Before our professionals suggest any particular treatment method or chemical solution, they conduct a thorough field test. This helps to determine the specific cause of the algae present in the swimming pool. Rather than using a trial and error approach, this proven step of our pool algae removal method saves both time and money for the pool owner. The San Diego area has specific types of algae that typically appear in the early summer months and infiltrates swimming pools. Understanding what types of algae are prevalent in the area is a vital component to achieving the total pool algae removal. 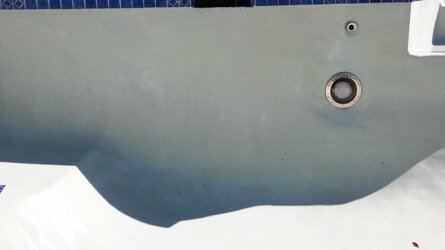 Just as each variety of algae is unique, each pool may require a different pool algae removal treatment to combat growth. Once our we are able to determine exactly what types of algae are present, the process of eliminating the algae begins. The treatment process typically takes around two or three days from start to finish. Once the algae has been identified the proper algae removal process can be scheduled. First the pool water treated and made free of unwanted algae. Next the pool surface is scrubbed clean and the interior surfaces are thoroughly vacuumed. Then the spa or pool filter is cleaned and treated to prevent the resurgence of another outbreak. This trifold treatment method is the most effective way to battle the problem. Now that the pool and spa water is crystal clear and ready to use, there is one final step to complete the pool algae removal process. Ongoing pool maintenance is a crucial element for successfully and consistently fighting off unwanted pool algae. Without routine maintenance, homeowners could find themselves battling the same algae problem again. The best way to avoid regrowth is to understand water chemistry. Pool service and maintenance programs should be done at regularly scheduled intervals. To help pool owners, we offer swimming pool orientations to give do-it-yourself owners the knowledge to prevent future algae issues. ProTouch Pool Services has been treating algae outbreaks in pools and spas throughout San Diego County for many years. We provide free consultations that include accurate water sampling and a detailed estimate for the pool algae removal. Since every situation is different, it is virtually impossible to provide an estimate without first performing a cursory examination. This needs to be done to determine the severity of the problem and the type or types of algae present. Our team applies the most appropriate algae treatment. In severe cases pool algae removal involves a drain and restart of the pool water. Using our proven methods, algae cleanup, removal and prevention is almost 100% successful. This includes phosphate remover and balanced water chemistry. If you are unable to enjoy your pool or spa due to unsightly algae, call today to get started on a solution that really works. Perhaps you have battled algae in past years and simply want to avoid the headache, call ProTouch today.